Homeowners deal with a variety of pests and nuisance animals. Some of these creatures are loud and some of them are destructive, but no other nuisance animal can create a lasting, pungent odor like a skunk (though opossums are a close second). Skunks are solitary creatures, enjoying a diet of insects and berries; however skunks that have learned about the variety of food near human habitats can become frequent visitors. When given the opportunity, a skunk will scavenge anything edible. Getting rid of a skunk isn’t as hard as it may seem. Yes, a skunk can spray you or your pet if threatened, but it’s a common misconception that any interaction with the creature will result in this event. In reality, skunks avoid using their defense system unless they feel there is no other option. It takes days for the fragrant substance to be made inside the body, and if the skunk expels its supply, it will be left vulnerable until more can be produced. For this reason, it is best to avoid cornering, chasing, or antagonizing a skunk near your home. This is also good cause not to let your dog chase the skunk thinking the canine will police your yard for you. Skunks are often carriers of rabies, so letting any living creature interact with them can provide much more harm than just a lingering odor. There are no approved poisons on the market for skunks, and there is no real loss in that lack of market share. Poisons should only be considered for select species, under circumstances approved by a wildlife professional. We do not ever kill skunks, as it is not an effective means of dealing with them. Items that are on the market tend to center on using predator smells against the skunk. Predator urine is used in a number of concoctions to be spread around the home and yard. These deterrents are rarely useful - read more about skunk repellent here. A skunk will pay no more attention to the smell of coyote urine near a home than it would a scent of coyote urine in the forest. The physical presence of a coyote is another story, but not viable option for skunk removal. Similarly defunct methods of control include ultrasonic emitters, water sprayers, and citrus sprayers. Skunks have shown no adverse reaction to ultrasonic sounds, and water or citrus will not deter an animal on the search for food. If you are having an issue with a skunk around your home, the best method of removal is live trapping. Click here to learn how to trap a skunk. 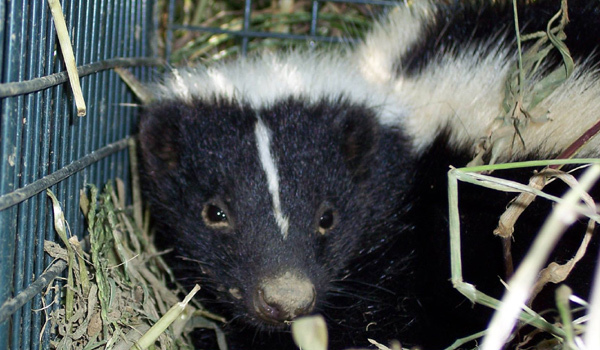 Skunks are not overly suspicious animals, making them relatively easy to trap. Purchase a live trap and place it out in your yard with food for a few days. Do not set the trap. You want the skunk to get used to the idea of the metal device being in its territory. After the introductory period, place some bait inside the set trap and wait. Be watchful of other neighborhood animals. Much of the bait used to attract skunks will also attract local cats. Once the skunk is contained, cover the trap with a tarp for transport. The tarp eliminates the visual stimuli for the animal and also protects against a spray attack. The skunk should be relocated at least five miles away from the home. Skunks are not inclined to return over long distances to previous den sites. For the sake of the skunk, the relocation area should have a plentiful source of food, water and shelter. It’s all well and good to get rid of a skunk, but it is in your best interest to skunk-proof your home before a skunk becomes a problem. As a prey animal, the skunk is not going to live out in the open space of your yard. An elevated deck, shed, or porch is an ideal place for shelter: read about how to get a skunk out from under a shed. Installing a perimeter barrier at these sites will help your cause tremendously. Skunks will dig, but they are not intense burrowers like some nuisance creatures. A sturdy barrier should be enough to keep them out. Cleaning up pet food and garbage is as important as boarding up the holes around your home. 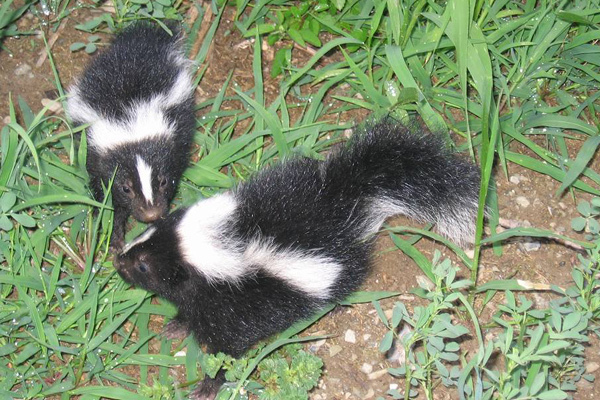 Skunks will not turn away a free meal and will often return to sites where they have previously found food. Read more about how to keep away skunks with prevention techniques. I wrote this website to provide information on How To Get Rid of Skunks in the case that you have a skunk problem and need to make an informed decision about what to do. If you have any questions you may email me, but I do know from experience that skunk removal is not simple. If you need professional help solving your wildlife conflict, I recommend that you talk to a professional skunk control expert in your town by clicking on my National Wildlife Control directory, which lists experts who I recommend in every USA city and town - over 300 locations serviced - who can help you with your skunk issue. How to catch skunks in the yard - Skunks out in the yard can take a little longer to catch than skunks that are actually living under a shed, deck, or porch. The reason for this is because you need to set the cage trap up in an area where you suspect the skunk will return to. If the animal was living under your deck, you would be able to create a pathway with fencing right from the den opening to the trap. Skunks that are just frequent visitors will cause a lot of damage to your yard over time. While this is mostly superficial damage, it still means you’re going to have a yard full of brown pockets where the critter has been digging for grubs and insects. Once you’ve purchased your cage trap, set it up on a level area where the skunk has been active. It’s important that the trap doesn’t wobble or make any sounds. If there are no stray animals around and no neighborhood cats, you can bait the device with moist cat food. For people who have a sizeable cat population around, marshmallows will limit the number of other animals that become interested in the trap. While you’re waiting to catch the skunk, you can go through your yard and cut the grass. This will dry out the soil and prevent the growth of insects that skunks love.